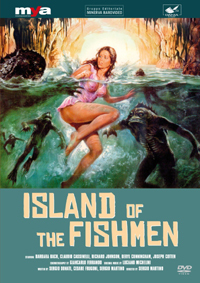 It’s 1891: Lieutenant Claude de Ross (Claudio Cassinelli), a military doctor, and a few newly escaped convicts are shipwrecked on a mysterious tropical island. They soon come across a strange couple: the sadistic Edmund Rackham (Richard Johnson) and the beautiful Amanda Marvin (Barbara Bach). The doctor finds out that Amanda’s father, professor Ernest Marvin (Joseph Cotten), is a mad scientist who is experimenting on horrible human-fish mutations. While Professor Marvin is convinced that he’s doing his research for humanitarian motives, Rackham has other plans, since he has discovered an incredible secret lying beneath the island.